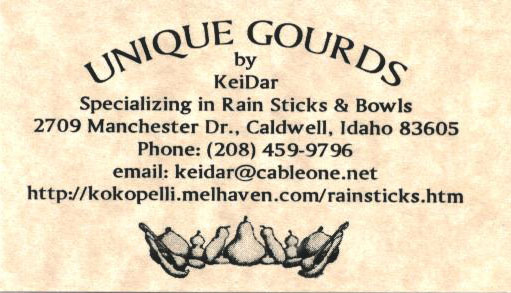 The Canyon Country Fair in Caldwell, Idaho was good to KeiDar. 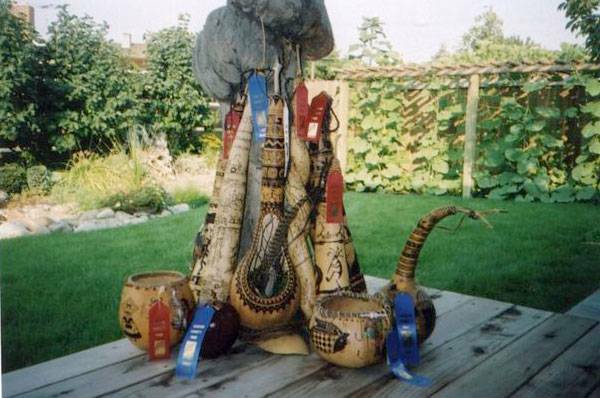 The RAINSTICK gets it’s name from the “sound of falling rain” it makes when turned upside down – (caused by the black beans, soy beans, small white beans, mung beans, lentils and rice place in the body of the gourd . For centuries, rain sticks have been used by the native inhabitants of many lands to beckon the rain gods. Made from many natural materials, i.e. bamboo, cactus and gourds. Rain sticks were commonly used in the various dances performed to entice the gods into providing the earthly inhabitants with life giving rain. Many of the RAINSTICKS we (KeiDar) make are decorated with Hopi Indian Kachina Dolls and/or silhouettes Kokopelli Dancers and/or Petro-Horses. Hundreds of small bamboo skewers are placed in the body of the gourd to produce the melodious sound of summer rain. Some of our RAINSTICKS are toped with a DREAMCATCHER. Indians believed the night air was filled with floating dreams – both good and bad. To encourage good dreams, Indian grandmothers fashioned dreamcatchers to hang above the cradleboards of sleeping infants, and to give to newly married couples to hang in their lodge. The dreamcatcher hangs freely in the breeze. The webbing captures the night’s dreams. Bad dreams become entangled and perish at the first light of day. Good dreams, knowing the way, float through the webbing, down the feathers and onto the dreamer. HAPPY DREAMS.